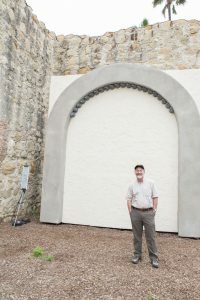 Bringing the Swallows Back to Mission San Juan Capistrano | JUVE Creative, Inc.JUVE Creative, Inc. 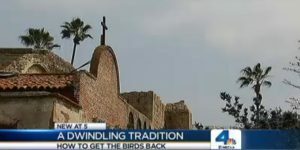 The miracle of the swallows of Capistrano takes place each year at Mission San Juan Capistrano, on March 19th, Saint Joseph's Day. Swallows migrate 15,000 miles from Goya, Argentina to San Juan Capistrano in large groups. 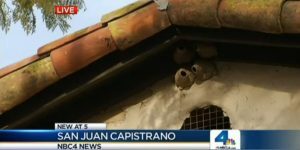 The San Juan Capistrano community welcomes visitors from all parts of the world to welcome the return of the swallows to the Capistrano Valley. The Return of the Swallows has been celebrated since the early 1930s. 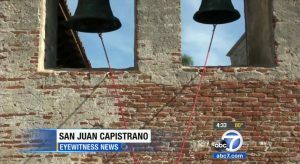 Before urbanization, Mission San Juan Capistrano was the main and largest building in the community, which is why the swallows continued to return every March. The development of the community and the stabilization of the Ruins of the Great Stone Church, where the swallow's nests were removed by preservationists, created alternative locations for the swallows to build their nests apart from the Mission. As a result, the number of swallows returning to the Mission each year began to decline. In 2010, in response to concerns about when the birds arrive and where they choose to nest, we sought the help of cliff swallows expert Dr. Charles R. Brown, a professor of biological sciences at the University of Tulsa who has studied more than 200,000 cliff swallows over the years. 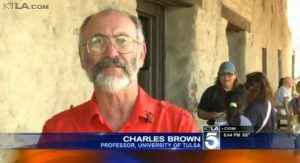 Dr. Brown was invited to present a lecture during the St. Joseph's Day & Return of the Swallows Celebration (his lecture has become an annual tradition). Shortly after, in collaboration with Dr. Brown and Executive staff at the Mission, we began an experiment on the Mission grounds in an effort to lure the birds back to nest. 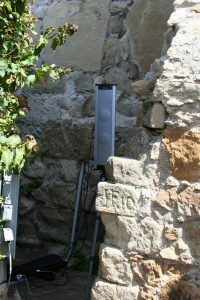 Phase I: Swallows Vocalization Project proved successful over the years; cliff swallows were spotted feeding overhead at the Mission and flying in to investigate the recorded sounds. Phase II: Nest Reenactment Project is in progress and shows signs of potential nest inhabitency. 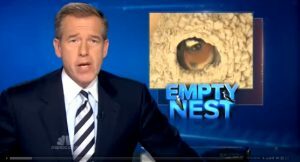 Achieved coverage on prime time and public broadcasting news stations, cable/international channels including a spotlight feature on NBC 4 Nightly News with then anchor Brian Williams. Achieved coverage in local publications and magazines. Increased tourism and local gate attendance. Sell-out attendance on St. Joseph's Day & Return of the Swallows celebration. "Working with the team at JUVE is like working with a breath of fresh air. Their total regard for the client's satisfaction, combined with their expertise in marketing initiatives ranging from traditional to social media provides a "whole package" experience for clients with budgets of any size. Christina Haakenson's methodical receipt and delivery of new ideas (that are always followed up on immediately and measured) combined with her dynamic team's competence and professionalism make working with JUVE easy, efficient and enjoyable. Being a non-profit destination with limited resources, our investment in JUVE has been a worthwhile investment in our mission and has exceeded our expectations. Their non-stuffy approach to problem solving - combined with regular "time outs" to measure and evaluate what is working and what needs shifting, makes for a solid working experience where the client doesn't have to direct the micro details. Overall working with JUVE is productive, efficient, fun, and exciting and I highly and enthusiastically recommend the team."